If the name of the game is finding value, then this list is a good place to start. It's not a complete list, of course. Just to give myself an opportunity to talk about different players, I limited it to those who don't already appear in my Sleepers (so no Pete Alonso, Matt Barnes or Collin McHugh) or Breakouts (so no German Marquez, Jesse Winker or Jon Gray) columns. For more on them, click on the links and be enlightened. No, these players aren't necessarily going to do something they haven't done before. We're just underrating what it is they do. For comparison, I've provided my own ranking (as well as colleague Heath Cummings') for the Rotisserie format, which is the only data FantasyPros compiles. Fear not, though, Head-to-Head points owners. There's relevant commentary throughout. First thing's first: The side injury this spring is nothing. The Astros have downplayed it loudly and consistently, suggesting that Jose Altuve would be playing already if it was the regular season. What wasn't nothing was the fractured kneecap that he tried playing through for much of last season, taking him from a .342 batting average, seven homers and 12 steals over the first three months to a .264 batting average, six homers and five steals over the final three. Kind of explains everything, doesn't it? You know how Mike Trout and Mookie Betts are 1 and 1A in drafts right now? That was Trout and Altuve last year. Altuve's ability to dominate the scarcest of categories (batting average and stolen bases) at the scarcest position (other than catcher, which hardly counts at a position) makes him uniquely elite and someone to build your team around. If you stretch your definition of "ace" to include Zack Greinke, then he's your golden opportunity to wait at starting pitcher and tackle other positions in Rounds 1-4. And why wouldn't you consider him an ace? You know what he has averaged over the past seven seasons? A 2.99 ERA, 1.10 WHIP and 186 strikeouts in 197 2/3 innings. You know what he has averaged over the past two? A 3.20 ERA, 1.08 WHIP and 207 strikeouts in 205 innings. Where's the letup? Where are the obvious signs of decline? Why are we so worried about a control-and-command specialist dropping off the face of the earth at age 35? His skills should age well and in fact already have. Not many pitchers are giving you 200 innings these days — only 13 last year, in fact — and Greinke is doing it with a plus ERA, plus WHIP and about a strikeout per inning. Add that he's as regular as the sunrise, and I'm not sure what more you could want from a starting pitcher. Most every high-end first baseman disappointed to some extent in 2018, but none is feeling it in his ADP quite like Jose Abreu, who is drafted more on the level of a Jesus Aguilar than the elites at the position. His track record alone deserves better than that. He was a .301 hitter over his first four years in the big leagues, averaging 31 homers a year. His 2018 was clearly a step back, but not in a way that suggests it's the new normal. What was normal were his strikeout, walk, line-drive and fly-ball rates — basically the entire batted-ball profile with one exception: Rather than clearing the fence, more of his fly balls went straight up in the air. That difference helps explain the drop in production, but it doesn't suggest the skills are eroding as much it does that baseball is weird. Given enough time, those numbers likely would have corrected themselves -- it had already started before injuries brought him down in August -- so I have little reason to think the Abreu we see now is any different than the one we were drafting in Round 3 last year. Yes, Justin Turner missed the first month and a half last year with a broken hamate bone, but on a per-game basis, his Head-to-Head production placed him between Javier Baez and Eugenio Suarez among the third base elite. Harder to say where a similar evaluation would have placed him in Rotisserie, but considering he's a plus contributor in home runs, RBI and runs scored and plus-plus in batting average, that's what he is: elite. Perhaps even more than you think. Concerning the broken hamate bone, his recovery compromised his power for his first several weeks back on the job, which is common with that injury. Over the final two months, though, he came alive, batting .357 with nine homers and a 1.067 OPS. You know where that version of Turner would have ranked among third basemen in Head-to-Head points per game? Try second, behind only Jose Ramirez. I'll admit I wasn't so gung-ho about Aaron Hicks at the start of draft prep season. He had some concerning batted-ball data in his past — not so much last year, but further back — that might suggest he's just a low-BABIP guy. I worried that an ill-timed slump could convince the Yankees to pull the plug, but then they signed him to a seven-year deal at the start of spring training. Clearly, they're committed and, in fact, so committed that they're intending to make him their leadoff hitter this year. His on-base skills shouldn't be in question, which means he'll be a run-scoring machine batting ahead of Aaron Judge, Giancarlo Stanton and Gary Sanchez. So clearly, there's upside even beyond his 21st-place finish among outfielders in Rotisserie leagues last year and 16th in Head-to-Head points, yet he's the 35th outfielder off the board on average. Because he's 36, there's a perception that Robinson Cano is beginning to break down, but health isn't the reason he played only 80 games last year, his first with less than 150 since 2006. No, he missed 80 games due to a failed PED test but came back in mid-August looking like the same hitter he has been since beginning the second chapter of his career with the Mariners in 2014. True, that version isn't as good as the one who played for the Yankees, but if you double last year's totals (accounting for the 80 games Cano played and the 80 he missed), that version has hit .294 with an average of 23.4 homers, 92.2 RBI and 86.6 runs over five seasons' time. Reports of his demise have been greatly exaggerated, and as a focal point of the Mets offense, he should be in line for similar numbers. Sometimes it's hard for me to take Gennett, undervalued though he may be, knowing Cano will still be there later. Eloy Jimenez was never going to make the opening day roster for the White Sox, not given the financial consequences of that move, but that same reality hasn't stopped Fantasy owners from investing big in Vladimir Guerrero, who now has a second impediment to his promotion in the form a strained oblique. And the truth is Jimenez's skills are similar. Guerrero is probably better, but we're comparing around the margins. Jimenez homered 22 times while striking out in just 69 of his 416 at-bats last year and himself earns uncommon marks for both power and bat control. I might rank him closer to where Heath Cummings does if Jimenez had put together the sort of spring performance that made his recent demotion an embarrassment for the White Sox, sort of like Ronald Acuna for the Braves last spring, because now he most definitely has to hit the ground running at Triple-A to earn that mid-April promotion. But even accounting for that risk, the upside is incredible for his going rate. The hallmark of an ace in 2019 is the ability to miss a bunch of bats over a bunch of innings, and Chris Archer has done it as consistently as anyone since breaking into the league, putting together three consecutive seasons with at least 200 innings and 230 strikeouts before last year's hiccup. And in an era when workload increases are no longer assumed, the best predictor of an ace is someone who has already done it. There are flaws, such as an ERA on the wrong side of 4.00 two of those three years, but the wrongs weren't wrong enough to drop him outside of the top 30 at starting pitcher (or even higher in points leagues) -- and that was with some horrid win-loss luck. Speaking of bad luck, his FIPs would suggest his ERAs shouldn't have approached 4.00 in the first place. And now that he's out of the AL East and in the better league for pitchers and working exclusively out of the stretch after the windup gave him so much trouble last year and expanding his arsenal after relying too much on his slider in years past, there's a better chance he lives up to that FIP this year. Um, have we already forgotten about Christian Yelich's radical transformation from above-average hitter to league MVP with his move to Miller Park last year? Granted, Dodger Stadium is no Marlins Park, the pitcher's haven from which Yelich was escaping last year, but it's closer to that end of the spectrum than Miller Park, where Yasmani Grandal has hit .296 with four homers and a .922 OPS in 54 career at-bats. He has a swing geared for power, elevating the ball at the expense of line drives, which has hurt his batting average in the past. But if more of those fly balls are sailing over the fence, it's also helping his batting average. And unlike for much of his Dodgers career, there are no impediments to his playing time in Milwaukee. Maybe if he was the third catcher off the board, I wouldn't quibble so much over the overall ADP, but in addition to J.T. Realmuto and Gary Sanchez, he's going behind Willson Contreras and Buster Posey, which doesn't add up for me. If Andrew McCutchen was already in decline, going to San Francisco last year was a sure way to exacerbate it. That isn't to say Pittsburgh is a hitter's dream itself, particularly not for right-handed hitters. No, McCutchen's first ever shot at such a venue came when he was traded to the Yankees last September, and though the sample size from that time was too small to tell us anything of consequence, he did homer five times in 87 at-bats. One skill he hasn't lost during this decline phase is the ability to get on base — just last year, he walked 95 times — and as the likely No. 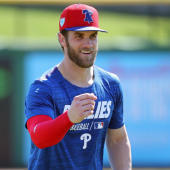 1 or 2 hitter for the Phillies, he'll be getting on base ahead of Bryce Harper, Rhys Hoskins and J.T. Realmuto. So between a venue change that figures to reverse some of his downward trends and a role that should maximize what he already does well, McCutchen could resurface as a top-20 outfielder this season. The elbow surgery that ended Yu Darvish's 2019 won't impact his availability for the start of 2019, so his precipitous drop in the rankings has more to do with how he performed before the injury last year, putting together 4.95 ERA and 1.43 WHIP during an eight-start debut with the Cubs. But his struggles weren't age- or health-related. He was throwing as hard as ever, in fact. They were mechanical in nature. He was struggling to find a consistent release point, tipping off his fastball in the process, but was showing signs of turning it around just before the injury struck. As I said for Archer, the best predictor of whether a pitcher can deliver the ratios and volume of an ace is if he has done it before, and Darvish was right there from 2012 through 2017. Yeah, there were some DL stints (I can still say DL when it's in the past, right?) that limited his inning totals, but start for start, he was a workhorse -- and one with near unmatched K/9 rates. The discount this year is almost too good to be true.